Hello dear friends! I am so honoured and excited to be guest-posting here at Golubka! I find Anya’s food philosophy and creativeness ever so inspiring and the beautiful posts at Golubka are always a real treat to all senses. Although my personal daily diet is vegan and mostly raw, I have not really ventured into the world of raw desserts. Thus, I wanted to share this chocolate and blueberry pudding with you today, because it reminds me of a childhood favourite of mine. These types of puddings are a staple in the Finnish kitchen and they can be made using berries, fruit, chocolate, or just milk and vanilla. They are so light, quick and easy to whip up and a perfect dessert or an afternoon treat! This time I’ve opted for a low sugar, vegan version that uses almond milk as a base. I’ve added blueberries, stevia, a touch of rice syrup and warming spices such as cinnamon and vanilla to provide all the sweetness it needs. The result isn’t overly sweet, but certainly ticks all the boxes for a perfect dessert. Hope you enjoy! 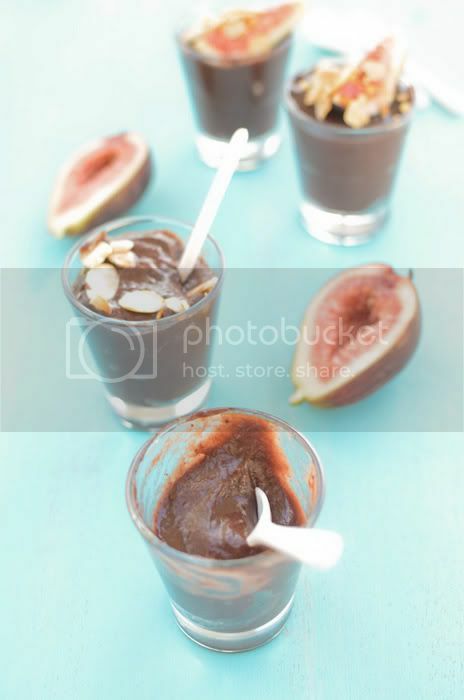 The easiest way to go about this recipe is to blend all the ingredients (that is, everything but the fresh figs and almonds) in a blender until smooth. Pour this mixture into a small saucepan and heat it, stirring constantly, on a medium heat until it thickens. This will take a few minutes. As soon as the pudding has thickened, remove the saucepan from the heat and place it in a sink filled with cold water. The water should reach about half-way through the saucepan. 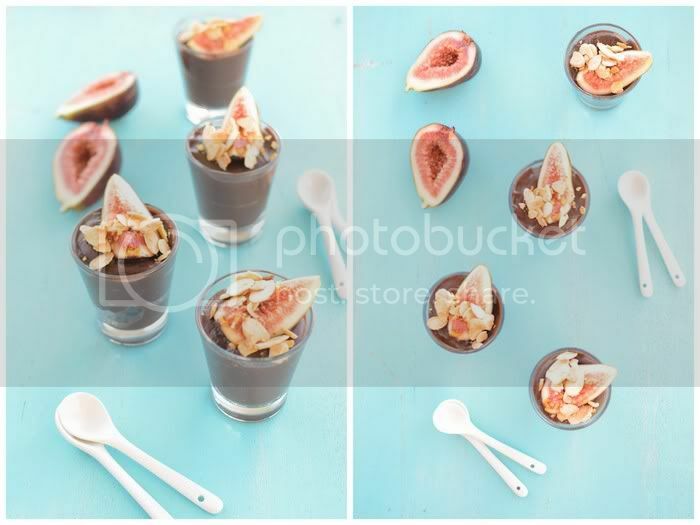 Leave the pudding to cool, then scoop it into serving bowls or glasses and top with fresh fruit and toasted almonds. Serve the pudding cool or at room temperature. Yey! 1st guest starts off with a bang of love! So excited to hear of all the guests bloggers that will be included on your site. This first one by Maria really looks inviting. What a great way and idea to showcase all the worldwide talent! Thank you for introducing me to this wonderful blog. I think it’s love at first sight. Potato starch is also known as potato flour. You can use corn flour if you can’t find any potato flour. I love Maria’s work, so nice to see her here. Great idea, thank you. Lovely and simple pudding recipe that I think even I can make. Thanks to Maria and Golubka! Great work Maria. The pictures are amazing. Thank you Golubka for introducing Scandi Foodie.